What does the war against data breaches have to do with security of file servers? Well, almost everything. Whole lot of companies have been using file servers to store all kinds of information, including sensitive and business critical data such as credit card information, sales reports, Accounting and HR documentation – to name a few. This information is accessible to employees according to a specified permissions policy. And this is where a system administrator who cares deeply for his kingdom to stay safe with every part of it wrapped up in all kinds of security measures should pay the most attention. Because threats don’t appear exclusively from the untamed outside. There may be an internal malefactor eager to steal information he’s not supposed to even see – and to use it to his advantage. And, sadly enough, to company’s misfortune. An inside job can be as devastating as a hacker attack, so keep an eye on both fronts. 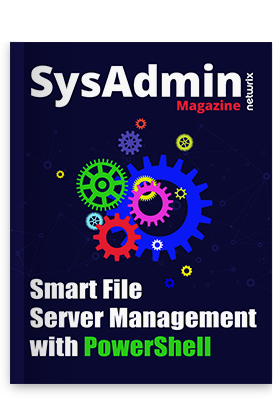 To help you with this challenge, we present to you the second issue of “SysAdmin Magazine” dedicated to security of file servers and containing helpful articles, tips, guides, and How-tos. Those may answer every question you have regarding file servers data staying safe and untouched by malicious invaders. The second issue of “SysAdmin Magazine” can be your go-to digest of the most effective advice from IT pros, and your next step to better security policy of shared information.